You’ve all seen Dirty Jobs with Mike Rowe on the Discovery Channel, right? Well Dr. George Harty can relate. Dr. Harty, Silver Cliff Vet Clinic, pregnancy checked (ranchers call it "preg checking") more than 100 cows and heifers on the TRH Ranch North of Lance Creek, WY on Monday. Our thoughts go out to the person that does George’s laundry. Definately a dirty job! 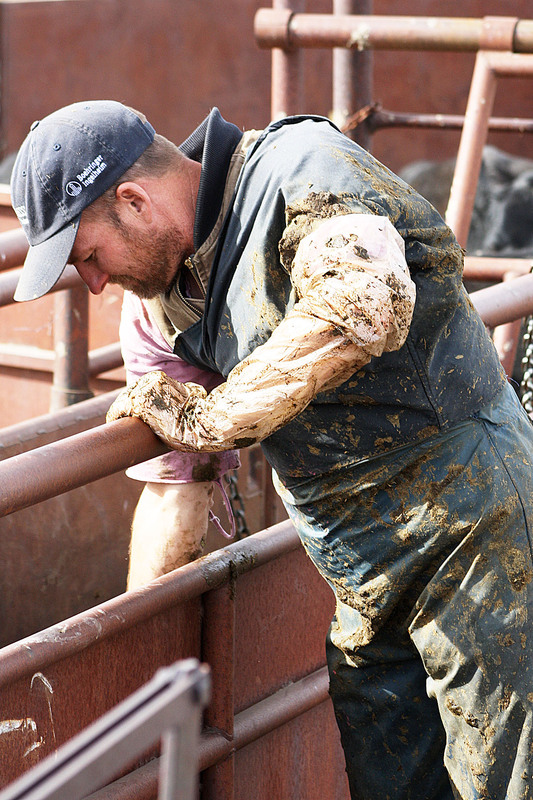 Have to love the hard working people that aren’t afraid to get dirty! Thank God he is wearing rubber bibs and shirt cover, or yes my laundry job would be a lot worse. The whole time I was standing there watching him, I kept thinking, “Oh, his poor wife! How does she ever keep her house clean?” Haha! Previous Previous post: Tell her what she’s won!